18F-fluorodeoxyglucose positron emission tomography (FDG-PET) can reveal the metabolic activity of malignant tumors. Recent advances gained from molecular studies suggest that tumor biology can be a good predictor of prognosis in breast cancer. We compared the ability of maximum standardized uptake values (SUVmax) derived by FDG-PET with tumor burden in predicting tumor recurrence for patients with breast cancer. 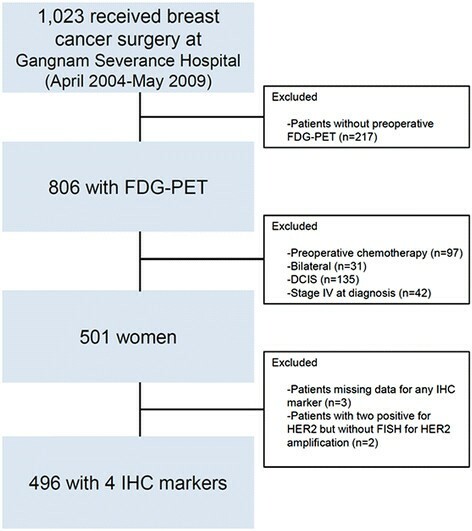 496 patients with breast cancer who underwent preoperative FDG-PET between April 2004 and May 2009 were retrospectively identified. SUVmax was obtained by FDG-PET, and the cutoff point was defined using a time-dependent receiver operating characteristic curve for recurrence-free survival (RFS). The primary endpoint was RFS. In multivariate analysis for RFS, SUVmax carried independent prognostic significance (hazard ratio, 2.39; 95% confidence interval, 1.20 to 4.76; P = 0.012). When the patients were classified into four groups according to the combined factors of tumor size (≤2 cm versus >2 cm) and SUVmax (<4 versus ≥4), RFS differed significantly (P < 0.001). Similarly, SUVmax had prognostic value in combination with nodal status (negative versus positive) or stage (I versus II and III) (P < 0.001 and P = 0.001, respectively). In hormone receptor–positive disease, SUVmax remained a significant prognostic factor for RFS based on multivariate analysis. Our results highlight the prognostic value of FDG-PET in prediction of tumor relapse for patients with breast cancer. Particularly in patients with hormone receptor–positive disease, the tumor metabolic information provided by FDG-PET is more significantly correlated with prognosis than tumor burden. Tumor burden, represented by tumor size and the number of involved lymph nodes, is the most important prognostic factor for breast cancer recurrence , because advanced-stage tumors are more likely to have distant metastases. In the genomics era, rapid advances in translational research have greatly improved our understanding of breast cancer biology. This work provides us with the tools that can identify intrinsic subtypes of breast cancer and discriminate a prognosis according to subtype , highlighting the clinical availability of tumor biology in breast cancer prognosis ,. These studies provide evidence that small tumors with undesirable biology can lead to a worse prognosis than large tumors with favorable biology. Therefore, to deliver more effective personalized medical treatment to individual patients, there is an increasing need to evaluate cancer with tumor biology integration, as well as simple anatomical staging. 18F-fluorodexoyglucose positron emission tomography (FDG-PET) is a useful tool in the prediction of tumor recurrence, as well as for providing relevant anatomical information, because this imaging modality reflects tumor biology well ,. It is one of the new tools that can capture tumor biology without an invasive procedure. The degree of FDG uptake reflects the metabolic characteristics of tumors and can be used as a prognostic factor in various malignancies. In breast cancer, studies have shown the contribution of tumor biology to increased FDG uptake - and have demonstrated that FDG uptake is associated with aggressive tumor characteristics ,. As like other molecular markers were compared or integrated with tumor burden, we wondered whether the prognostic power of current clinical parameters improves when the biologic information of FDG-PET is combined with them. In this retrospective study, we evaluated the potential of FDG uptake as a prognostic indicator in breast cancer as compared to, and in combination with, tumor burden. Between April 2004 and May 2009, 1,053 women consecutively underwent surgery for breast cancer at our institution. Of these 1,053 patients, 835 underwent preoperative FDG-PET as a part of their routine preoperative staging. Patients were excluded on the basis of the following criteria: known bilateral breast cancer (n = 31), preoperative chemotherapy (because chemotherapy can affect tumor characteristics related to FDG uptake) (n = 94), ductal carcinoma in situ (n = 135) and distant metastases at initial assessment (n = 42). Among these patients, 501 women of interest were identified. Patients missing data for any immunohistochemical marker were excluded (n = 3). Patients with an immunohistochemistry (IHC) scores of 2+ for human epidermal growth factor receptor 2 (HER2), but without fluorescence in situ hybridization (FISH) results for HER2 amplification, were also excluded (n = 2). Data for the remaining 496 patients were entered into the analysis (Figure 1). CONSORT chart outlining the study plan. DCIS, Ductal carcinoma in situ; FDG-PET, 18F-fluorodeoxyglucose positron emission tomography; FISH, Fluorescence in situ hybridization; HER2, Human epidermal growth factor receptor 2; IHC Immunohistochemistry. For the immunohistochemical study of four markers, formalin-fixed, paraffin-embedded tissue sections obtained from the surgical specimens were stained with appropriate antibodies for estrogen receptor (ER) (Novocastra; Leica Microsystems, Newcastle upon Tyne, UK), progesterone receptor (PR) (Novocastra; Leica Microsystems), HER2 (Ventana Medical Systems, Tucson, AZ, USA) and Ki-67 (MIB-1; Dako, Glostrup, Denmark). For HER2 evaluation, membranous staining was graded with a score of 0, 1+, 2+ or 3+ . HER2 status was considered positive with a score of 3+ and negative with a score of 0 or 1+. Tumors with a score of 2+ were sent for FISH testing performed using the PathVysion HER-2 DNA Probe Kit (Abbott Molecular, Des Plaines, IL, USA). The staging was performed according to the American Joint Committee on Cancer (AJCC) system . The Elston-Ellis modification of the Scarff-Bloom-Richardson grading system was used for tumor grading. Adjuvant systemic therapy and/or radiotherapy were administered according to the standard guidelines based on patient age, primary tumor characteristics and axillary lymph node status. Endocrine therapy was given to patients whose tumors were positive for hormone receptor expression. The follow-up protocol included planned regular visits every 6 months, and missed appointments were followed by telephone calls to minimize the number of patients lost to follow-up and improve the accuracy of the survival data. The final update to the clinical database was made in December 2013. The institutional review board (IRB) of Gangnam Severance Hospital, Yonsei University, Seoul, Korea, approved the study in accordance with Good Clinical Practice guidelines and the Declaration of Helsinki. The IRB granted a waiver of written documentation of informed consent from all participants because of the retrospective study design. Prior to undergoing FDG-PET, each patient was asked to fast for a minimum of 8 hours, and blood glucose levels were controlled to <130 mg/dl. Patients received an intravenous injection of 18F-FDG (0.14 MBq) in the arm contralateral to the primary tumor. Sixty minutes after injection of 18F-FDG, whole-body emission scans were obtained using a Philips Allegro PET camera (Philips Medical Systems, Cleveland, OH, USA). Scans were obtained with the patient in the supine position with the arms raised. Attenuation-corrected transaxial images were reconstructed with an iterative transmission algorithm (row-action maximum likelihood three-dimensional protocol) using a three-dimensional image filter in a 128 × 128 matrix. For semiquantitative evaluations, maximum standardized uptake value (SUVmax) was calculated by measuring the 18F-FDG absorption by tumors in the region of interest (ROI) using the following equation: SUVmax = (maximal radioactivity concentration in the ROI (μCi/g)/injected dose (μCi)/patient’s weight (kg)). All FDG-PET scans were reviewed by two nuclear medicine radiologists who were blinded to survival data. SUVmax was obtained at the time of the imaging procedure. The cutoff point of SUVmax was obtained by using the time-dependent receiver operating characteristic (ROC) curve. Age is presented in the study as median value with a range and was compared by the Mann-Whitney U test. Discrete variables were compared by performing a χ2 test. The primary endpoint was recurrence-free survival (RFS), which was measured from the date of the first curative surgery to the date of the first tumor recurrence, including locoregional recurrence or distant metastasis or death. Breast cancer–specific survival (BCSS) was measured from the date of the first curative surgery to the date of the last follow-up or until death due to breast cancer during the follow-up period. The Kaplan-Meier method was utilized to estimate RFS or BCSS. Using Harrell c-statistics , the concordance index (c-index) was calculated to measure the concordance for time-to event data, in which increasing values between 0.5 and 1.0 indicated improved prediction. The significant prognostic factors associated with RFS were selected based on the c-index (Additional file 1). The Cox proportional hazards regression model was used for multivariable survival analysis. To assess the additional prognostic value of SUVmax, we used changes in the likelihood ratio values (LR − Δχ2) to quantitatively measure the relative amount of information for SUVmax compared to the model without SUVmax. The cutoff value of young age was defined as 35 years in accordance with a previous Korean study . SPSS version 18 (SPSS, Chicago, IL, USA) and R  were used to perform these analyses. Statistical significance was defined by a P-value <0.05 or a 95% confidence interval (CI). The cutoff point of SUVmax was obtained using the time-dependent ROC. The time-dependent ROC curve for SUVmax in relation to RFS yielded an area under the curve of 0.673 (95% CI, 0.588 to 0.753) (Additional file 2). Youden’s index was the highest for SUVmax of 4.2. Considering the clinical application, we defined the SUVmax cutoff as 4. A total of 496 patients with breast cancer were included in the analysis. The median age of the cohort was 48 years (range, 25-80 years). The median and mean SUVmax were 4.3 ± 3.1 and 3.2 (range, 0.3-32.9), respectively. When patients were divided into two groups according to SUVmax, these groups differed significantly in T stage, N stage, AJCC stage, which represent tumor burden. They also differed in characteristics reflecting tumor biology, including histologic grade, ER, PR, HER2, and Ki67. In considering the distribution of tumor subtypes, the group with high SUVmax had a higher rate of luminal B, HER2, and triple-negative subtypes. In contrast, the proportion of patients with the luminal A subtype was relatively low in the group with high SUVmax (Table 1). A higher rate of mastectomy was noted in the group with high SUVmax (Table 1). aAJCC, American Joint Committee on Cancer; ER, Estrogen receptor; HER2, Human epidermal growth factor receptor 2; PR, Progesterone receptor; SUVmax, Maximum standardized uptake value. Data are number of patients (%), except for age. bχ2 test. cData with missing values. dHER2 positivity was defined as a 3+ score on immunohistochemistry or amplification on fluorescence in situ hybridization. At a median follow-up of 6.03 years, tumors had recurred in 40 patients. There were 13 patients with locoregional recurrences, 25 with distant metastases and 2 with combined local recurrence and distant metastases. During the follow-up period, 11 deaths occurred, 8 of which were breast cancer–specific and 3 of which were not breast cancer–specific. The probability of RFS at 6 years was 95.6% for patients with low SUVmax and 86.8% for patients with high SUVmax. High SUVmax was significantly predictive of decreased RFS (P < 0.001 by log-rank test) (Figure 2A). Furthermore, patients with high SUVmax showed a reduced BCSS (P = 0.007 by log-rank test) (Figure 2B). When adjusted for age of diagnosis, T stage, nodal status and ER status using the Cox proportional hazards regression model, high SUVmax was significantly associated with risk of tumor relapse (hazard ratio, 2.39, 95% CI, 1.20 to 4.76) (Table 2). For this model, the Harrell c-index was 0.745. The c-index for the multivariate model without SUVmax was 0.724. The LR-Δχ2 showed a significant improvement of the additional prognostic utility of SUVmax. Kaplan-Meier plots for disease-free survival and breast cancer–specific survival. (A) Recurrence-free survival (P = 0.001). (B) Breast cancer–specific survival (P = 0.007). SUVmax, Maximum standardized uptake value. All P-values were calculated by the log-rank test. aCI, Confidence interval; HER2, Human epidermal growth factor receptor-2; SUVmax, Maximum standardized uptake value. bP = 0.009 and χ2 = 25.41 for the comparison with the analysis without SUVmax (by the likelihood ratio test). Four patient groups were classified according to SUVmax and tumor size: (1) tumor size ≤2 cm and SUVmax <4; (2) tumor size >2 cm and SUVmax <4; (3) tumor size ≤2 cm and SUVmax ≥4; and (4) tumor size >2 cm and SUVmax ≥4. The RFS of the four groups differed significantly (P < 0.001) (Figure 3A). Within the groups of large tumor size (>2 cm) and small tumor size (≤2 cm), RFS differed significantly according to the SUVmax (P = 0.049 and P = 0.009, respectively). Conversely, within the groups of high SUVmax and low SUVmax, RFS did not differ according to tumor size (P = 0.350 and P = 0.096, respectively). Kaplan-Meier plots for recurrence-free survival according to combined factors with tumor burden and SUV max . (A) Tumor size (P < 0.001) (B) Node status (P < 0.001) (C) Stage (P = 0.001). SUVmax, Maximum standardized uptake value. All P-values were calculated by the log-rank test. Furthermore, SUVmax was significantly predictive of RFS in combination with nodal status (P < 0.001) (Figure 3B). Node-positive patients with high SUVmax had worse outcomes, whereas node-negative patients with low SUVmax had better outcomes. Similarly, SUVmax combined with stage was significantly correlated with RFS (P = 0.001) (Figure 3C). After the patients were divided into three subtypes (luminal, HER2 or triple-negative), multivariate analysis for RFS was performed in each subtype. In luminal subtypes, which were defined as hormone receptor–positive breast cancer (ER-positive and/or PR-positive), SUVmax was found to be a significant prognostic factor for RFS based on multivariate analysis (Table 3). However, in HER2 or triple-negative subtypes, SUVmax was not an independent prognostic factor (Additional file 3). aCI, Confidence interval; HER2, Human epidermal growth factor receptor 2; SUVmax, Maximum standardized uptake value. The prognostic value of SUVmax combined with tumor burden was also assessed in hormone receptor–positive breast cancer. When the patients were classified into four groups according to both combined factors, RFS differed significantly (P < 0.001) (Figure 4A). There was no difference in RFS when patients were stratified by tumor size within the groups with high SUVmax and low SUVmax (P = 0.950 and P = 0.688, respectively). However, within the groups with small tumor sizes (≤2 cm), a significantly reduced RFS was found in patients with high SUVmax (P = 0.044). In patients with large tumor sizes (>2 cm), RFS did not differ significantly according to SUVmax (P = 0.065), possibly due to the limited number of patients (n = 122). Kaplan-Meier plots for recurrence-free survival according to a combined factor that includes both tumor burden and SUV max in hormone receptor-positive cancer. (A) Tumor size (P = 0.028) (B) Node status (P = 0.006) (C) Stage (P = 0.029). SUVmax, Maximum standardized uptake value. All P-values were calculated by the log-rank test. In luminal breast cancer, SUVmax was still predictive of RFS in combination with nodal status (negative vs. positive) and stage (I vs. II and III) (P < 0.006 and P = 0.029, respectively) (Figure 4B and 4C). The results of our study demonstrate the ability of SUVmax to predict clinical outcomes in a large cohort of breast cancer patients who underwent FDG-PET. SUVmax carried independent prognostic significance in multivariate analysis for prediction of tumor relapse. Attempts to validate FDG uptake as a prognostic indicator in breast cancer have been made in previous studies -. However, failure to be validated as an independent prognostic factor , small number of patients  and analysis based on a web-accessible risk-assessment model (Adjuvant! Online)  were limitations. Despite these limitations, those studies provided evidence that that FDG uptake has potential as a prognostic marker in breast cancer, which seems reasonable because tumors with increased glucose uptake show aggressive tumor behaviors and high proliferative propensities -. Other studies have consistently shown that breast cancer with a high SUVmax is associated with ER negativity, high histologic grade, high Ki67 and the triple-negative subtype -, which is consistent with our data (Table 1). In support of the clinical significance of tumor biology–associated glucose metabolism are recent studies showing that several signaling pathways implicated in cell proliferation and tumor progression also regulate metabolic pathways -. Particularly in the survival analyses using a combined factor with SUVmax and tumor burden, SUVmax showed a superior prediction of RFS in breast cancer compared with clinical tumor load. After four groups were formed using SUVmax and tumor size, within the groups with high or low SUVmax, tumor size did not provide additional prognostic differentiation (Figure 3A). However, within the groups with large or small tumor size, SUVmax improved the prediction of RFS. Similar results were seen when SUVmax was combined with nodal status or AJCC stage (Figures 3B and 3C). These findings suggest that when tumor biology is considered in addition to clinical tumor burden, prediction of breast cancer prognosis can be improved. SUVmax could provide powerful prognostic information about tumor relapse that is superior to considering only tumor burden, similar to the contribution of molecular subtype. There are established molecular predictors reflecting tumor biology and predicting prognosis in breast cancer. Although the reason that the multigene assays are actively utilized for ER-positive disease has not been fully clarified, authors of meta-analyses of various multigene breast cancer signatures concluded that the prognostic values of the signatures are comparable when evaluated in hormone receptor–positive breast cancers, presumably due to the fact that the proliferation modules within these diverse gene signatures are a common driving force behind their overall prognostic performance ,. By contrast, hormone receptor–negative breast cancers are more proliferative and are usually classified as high risk or are not the appropriate target population for these prognostic signatures ,. 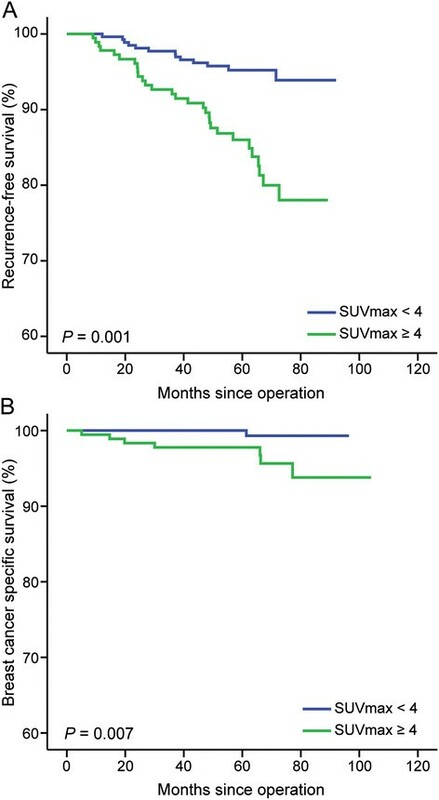 In the same context, our results show that the prognostic significance of SUVmax is distinct for luminal tumors (Table 3, Figure 4). Furthermore, the mean SUVmax for the luminal subtype was the lowest, whereas the values for the HER2 and triple-negative subtypes were comparatively higher (Additional file 4). This finding is concordant with previous reports comparing SUVmax between the IHC-defined subtypes . It seems reasonable that HER2-positive or triple-negative tumors would show increased accumulation of FDG, because these tumors have an aggressive phenotype and are associated with a high rate of proliferation, high Ki67 concentration and high histologic grades. These associations between aggressive markers and high SUVmax were concordantly observed in our study (Table 1). Because HER2-positive or triple-negative tumors generally show high SUVmax, this may also lead to a reduced prognostic significance of SUVmax in these kinds of tumors. We acknowledge several limitations inherent in our study’s retrospective design. We were unable to control for variations in adjuvant therapy that may have influenced survival outcomes. Compared to the low SUVmax group, the patients in the high SUVmax group received more chemotherapy and less endocrine therapy, likely because they had more advanced stage disease and ER negativity. The cutoff point for SUVmax defined within a single cohort also needs to be validated in an external cohort. However, there was not a significant difference in the number of patients who received radiation treatment between the high SUVmax group and the low SUVmax group. There was also no survival difference between patients who received adjuvant chemotherapy or radiotherapy (Additional file 1). Our study highlights the prognostic value of FDG-PET in predicting tumor relapse for breast cancer patients. We provide evidence supporting the potential utility of FDG-PET in combination with clinical tumor burden for the assessment of prognosis as well as evaluation of tumor location in patients with breast cancer. These results lay the groundwork for future studies on the prognostic implication of SUVmax for breast cancer treatment. Sung Gwe Ahn, Jong Tae Park contributed equally to this work. This research was supported by the Basic Science Research Program through the National Research Foundation of Korea (NRF), funded by the Ministry of Education, Science and Technology (grant 2013R1A1A2007759). The final manuscript was prepared with the assistance of BioScience Writers LLC (Houston, TX, USA). All authors made substantial contributions to the conception and design, analysis and interpretation of data, and critical review of the manuscript. SGA and JJ conceived of the study and coordinated the data acquisition and analysis. SGA and JTP principally wrote the manuscript. SGA, JTP and KH mainly performed the analyses. TJJ and YHR performed FDG-PET and obtained SUVmax. HML, HWL, SAL, SMD and EJS performed part of the analysis, contributed to the data and helped to draft the manuscript. All authors were involved in drafting the manuscript or revising it critically for important intellectual content. All authors read and approved the final manuscript. The R Project for Statistical Computing. http://www.r-projet.org.